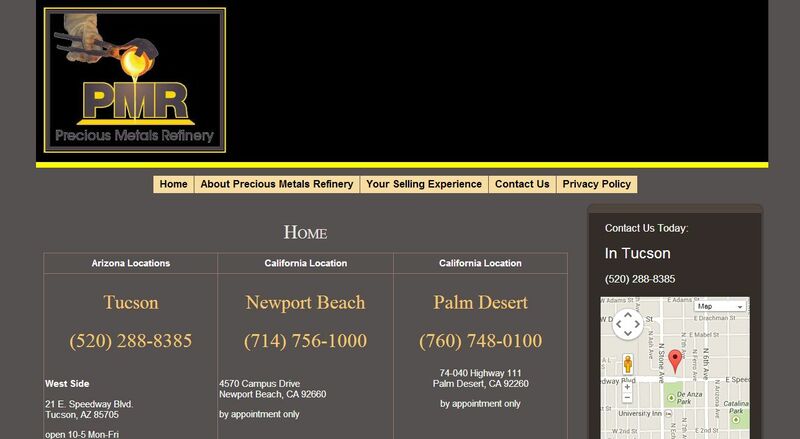 Precious Metals Refinery address, phone, website, hours of operation, and more. With over 46 years of experience in the jewelry industry Precious Metals Refinery was founded by our CEO Richard Baron as a premier gold buying company. Mr. Baron is the former executive director of the National Association of Jewelry Appraisers; He has owned retail jewelry stores served as a director of the National Association of Watch Dealers and has extensive experience dealing with precious metals and the refining of precious metals. Precious Metals Refinery was built on integrity, accuracy and consistency. We are committed to maintaining state of the art practices. Our employees are experienced and trained professionals. Our reputation speaks for itself. Precious Metals Refinery provides a private and comfortable atmosphere for our clients. What differentiates us from our competition is our customer friendly manner in which we buy gold and jewelry. We are very respectful and sensitive to our clients’ needs. We understand that sometimes parting with an old piece of jewelry can be hard to do especially if it has sentimental value.